In March, Yellowknifers practically heave a collective sigh of relief, as the end of the long winter is finally in sight. While we can’t delude ourselves that it’s not still cold, as evidenced by the frozen lakes, the sun is certainly up for longer, its heat can be felt, and on some days the snow begins to melt. At the end of February, the sun rose around 7:45am and set around 6pm, so we experienced just over 10 hours of sunshine. Now, at the end of March, it’s been rising around 7am and setting around 8:15pm. We may still have our coats on, but we’ve gained 3 hours of sunshine in the course of a month and we can feel that spring is in the air. With the sun comes the fun, although in this town there’s no shortage of it, even in the darkest depths of winter. 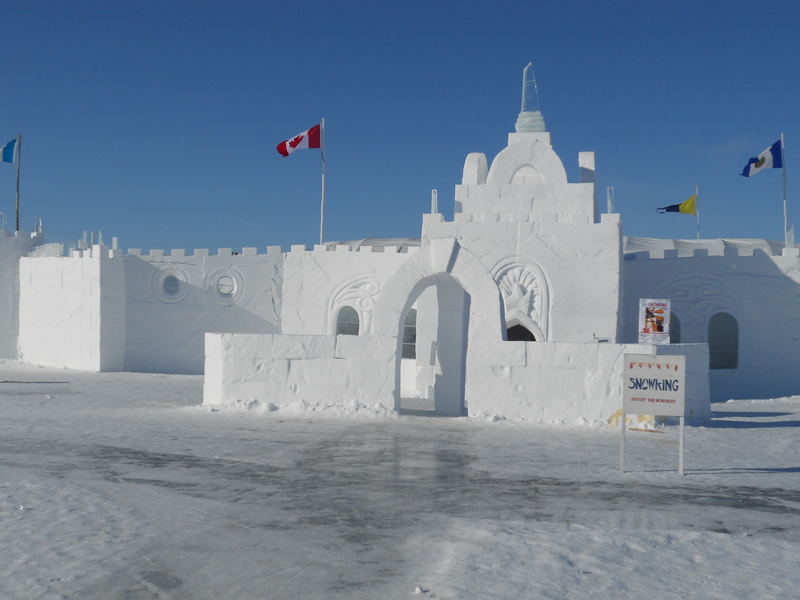 Everybody knows that March is Snow Castle time. 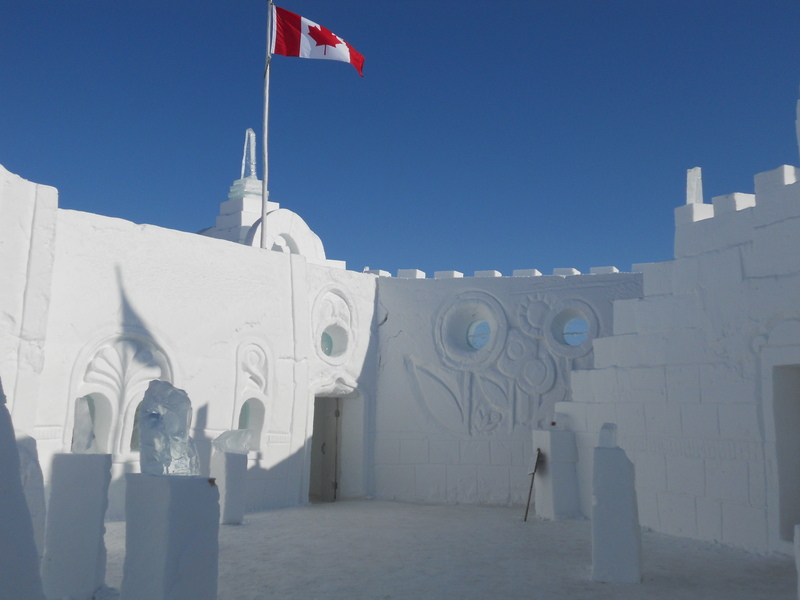 It’s a castle on the frozen Great Slave Lake, built of ice and snow by a local resident referred to as The Snow King, with the aid of his merry band of assistants. This has been going on for 18 years, and the castle is different each year. 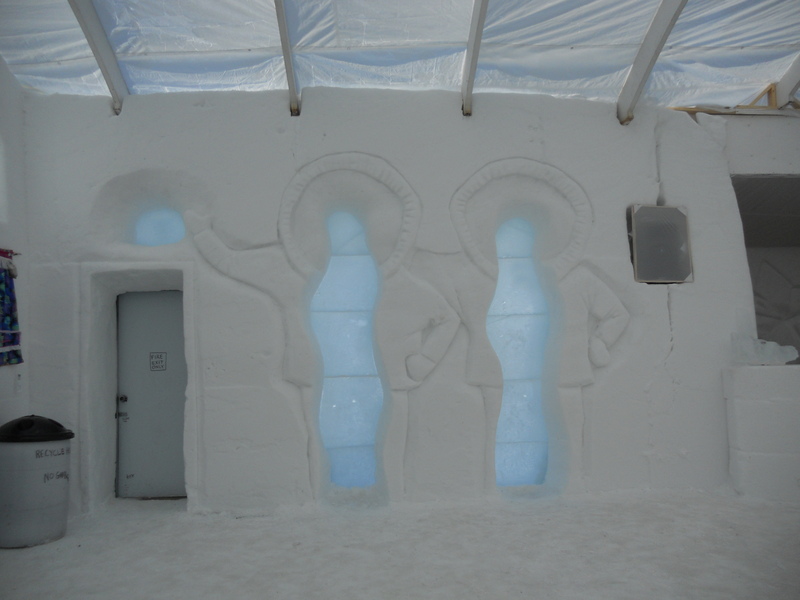 It opens at the beginning of March, and aside from being a winter attraction in and of itself, it’s a venue for parties and arts and entertainment events for the entire month. This is the third Snow Castle that I’ve seen and this year it’s bigger than last year’s version. It can be crowded on weekends, so I paid a visit at lunchtime on a brilliantly sunny but cold week day, and I had it practically to myself. It felt like walking inside a work of art, when you consider that blocks of ice had to be cut and hauled from the lake, then stacked and fit to make walls, doorways and hallways. The ice was mostly covered with snow, especially on the floor, which would be a skating rink otherwise. I ventured out into the courtyard and discovered a long slide made of ice. Into the walls were carved various shapes and decorative windows. Indoors, there was a hall for entertainment, and small rooms or enclosures off to the side. It was sheltered from the wind, yet it was still cold. There was artwork on the walls, and in one of the side rooms, there were small tables made of ice, with cut logs for stools. It was very bright and inviting, and it made me want to stay, at least until my feet began to freeze. 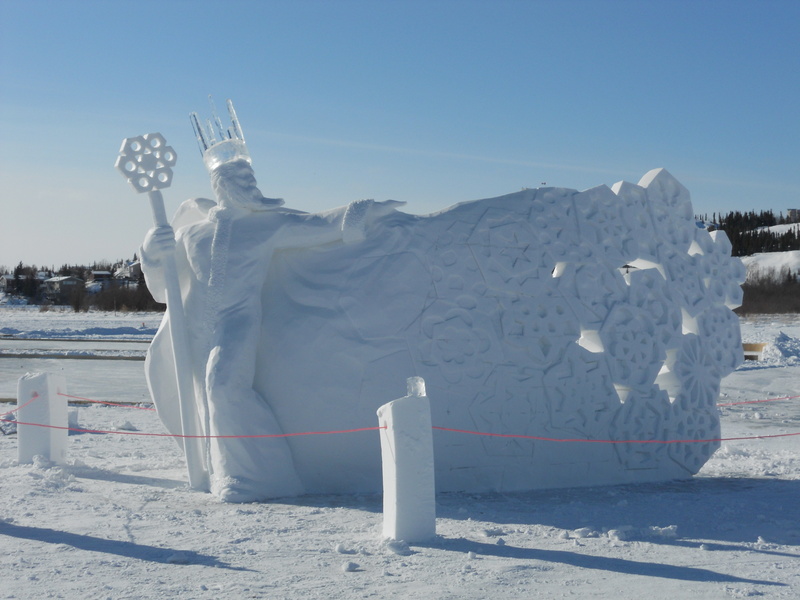 Outside, there was a beautiful regal carving of snow and ice, glistening in the sun. 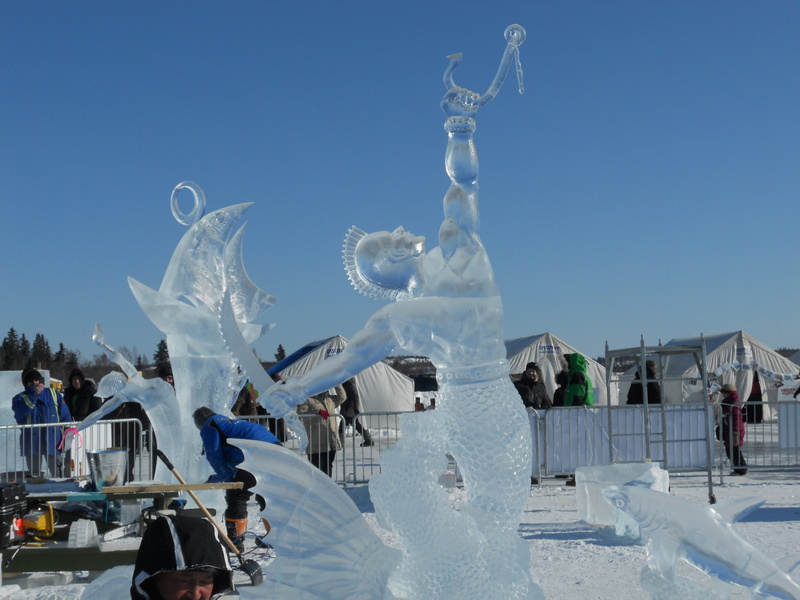 A stone’s throw from the castle, the frozen lake offers the chance for some fun in the sun, in the form of a winter carnival, complete with unlimited space for parking. It’s somewhat amusing that without giving it a second thought, we treat the ice as if it were land. 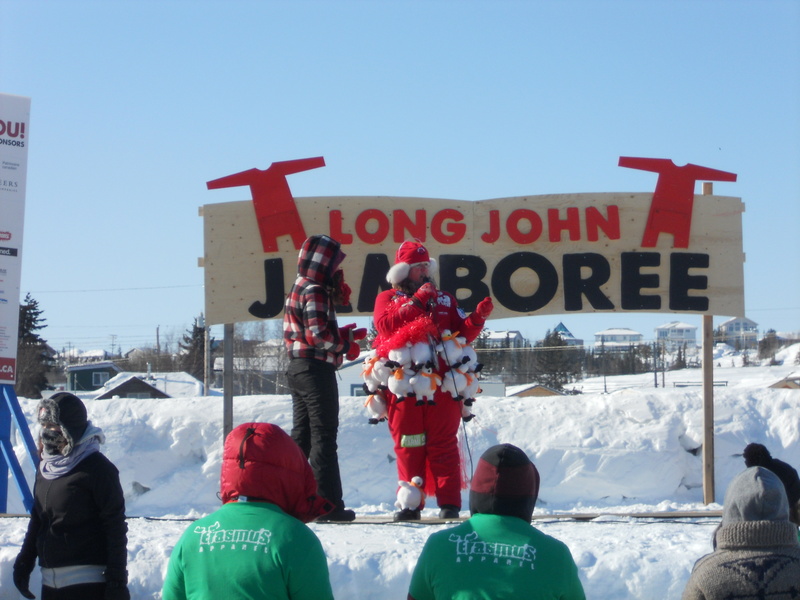 The Long John Jamboree is a weekend event, and it’s so popular that many businesses close early on the Friday, to allow their employees to attend. It’s in its second year of existence, and I’m told that prior to that, there was a similar event called the Caibou Carnival. At the jamboree, announcers and organizers can be spotted from afar due to their red long johns. The public is encouraged to don their long johns and strut their stuff on the Snow Stage in a Flaunt Yer Skivvies event, a long john fashion show. Circling the Snow Stage are several tents, including a food tent, a sugar shack, and others hosting various activities for young and old, including bands playing live music. One of the funnier events of the jamboree is The Ugly Truck and Dog Show. 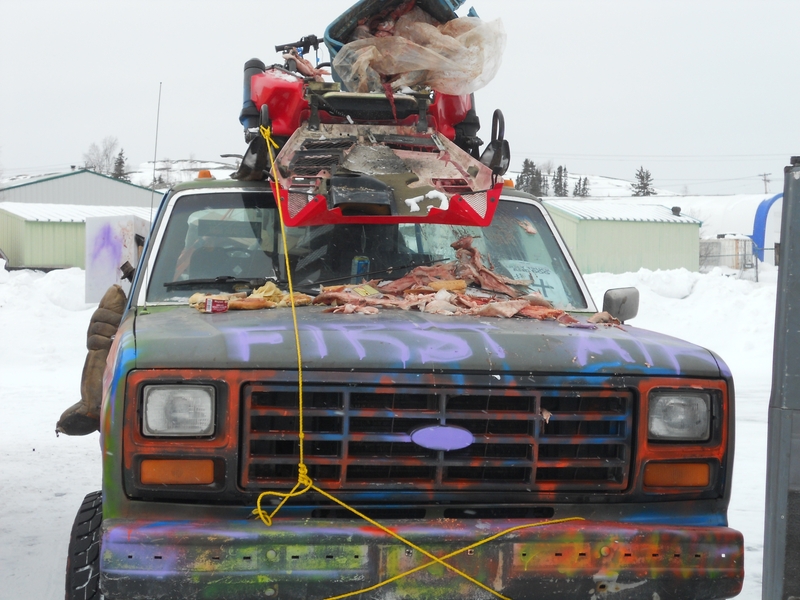 Yellowknifers love their trucks and their dogs, and in this contest they make both as unsightly as possible. Entrants go all out in a bid to win and some of the entries are very creative. This year I didn’t arrive in time to see the show, but this photo that I took at last year’s event provides a good idea of the goings-on. 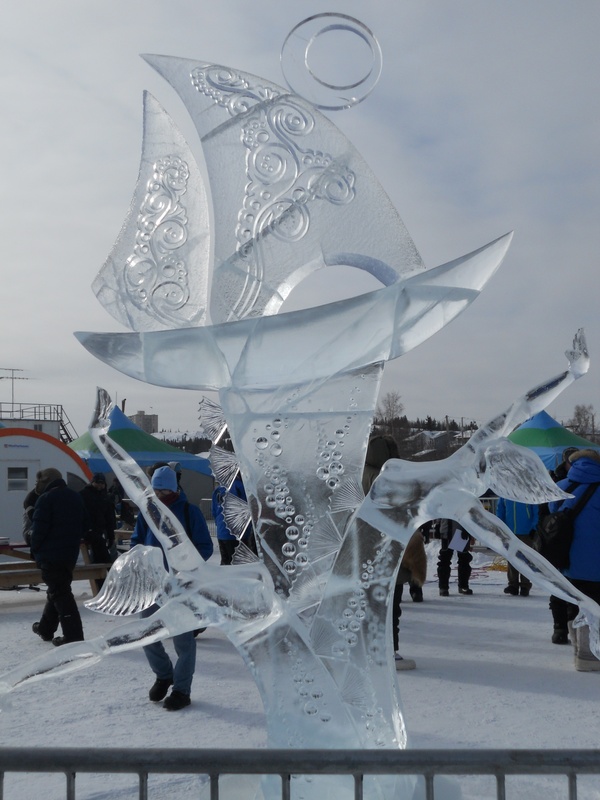 An event that really captures my attention is the ice carving contest. 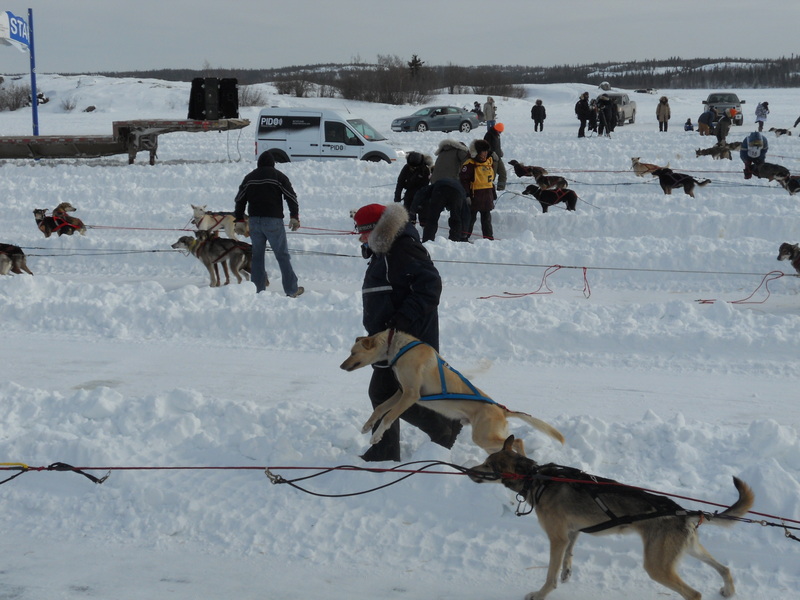 There are competing teams from the Northwest Territories, other parts of Canada and from the US. 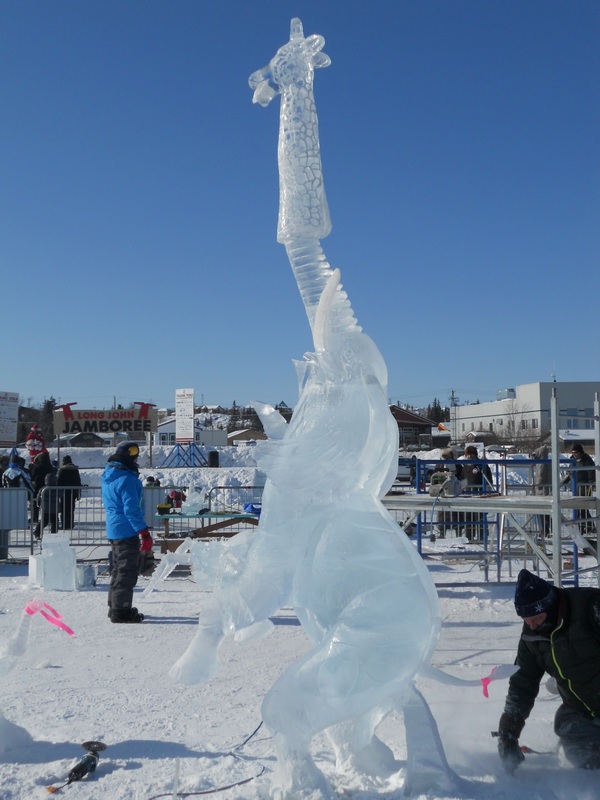 It’s always fascinating to see blocks of ice converted into some very intricately carved figures. It can be quite cold in the wind, so I don’t envy the carvers for having to work outdoors. But I suppose that they’re quite accustomed to it. This year’s 1st prize was won by a team hailing from Wisconsin and Washington state, and their entry, called Guardian of the Deep, also happened to be one of my favourites. 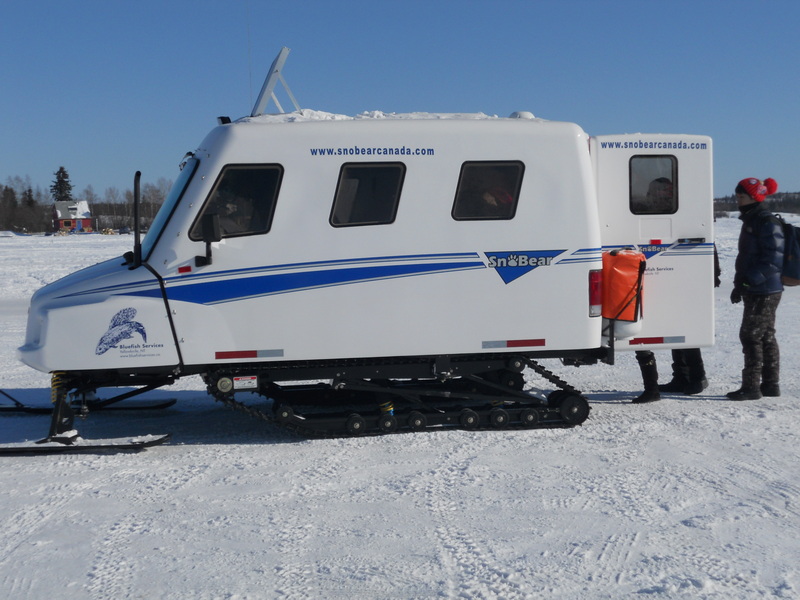 There are other outdoor events at the jamboree, such as helicopter rides to take in views of the surrounding area from the air, and ice-fishing trips with transportation in a “bombardier” – an old-fashioned snow vehicle. I happened to see one of these arrive to collect some passengers. 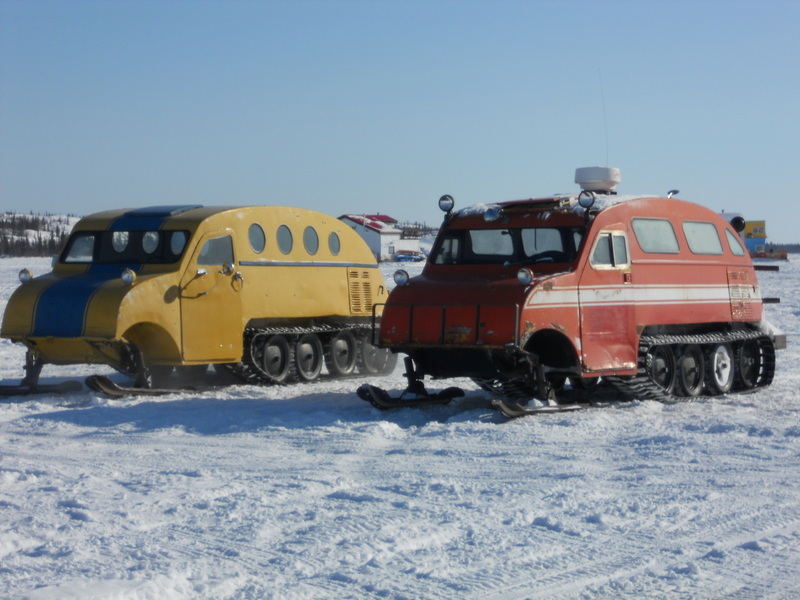 I had never seen one before, and it was a rather curious-looking vehicle, with skis on the front, tracks on the back, and a body that reminded me of a submarine. Good things come in threes: less than an hour later, two more bombardiers trundled along, these looking like older versions, relics from another era. For sport, the jamboree offers something for every taste: a snow beach volleyball tournament, a skijoring race, and an abominable snow race – on foot – to Dettah and back, a distance of about 14km. I was there when the runners set off. They were a small and chilly-looking bunch, but they took off with great enthusiasm. On the Saturday night, after a full day of activities, patrons can warm themselves up with some hot chocolate while they watch a huge bonfire and fireworks. 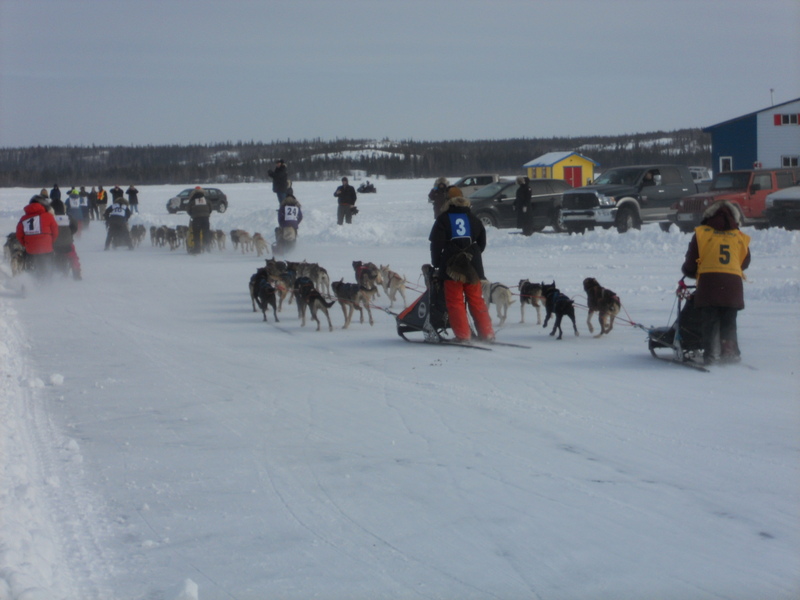 One event that I was keen to see was the start of the Diavik 150 Dog Derby, which happened elsewhere on the lake, just off the ice road. This race has been run for years, and it attracts champion dog racing teams. It takes place over 3 days, covering 50 miles each day. When I arrived, it was hard to figure out whether the people or the dogs were more excited. There was a lot of yipping and yapping to be heard, both from the dogs that were being harnessed to the sleds, and from those still in the trailers, who seemed to fear that they were being left behind. There were around 9 teams with about 10 dogs per sled, and given their high excitement level, I’m sure that it would have been utter chaos if the mushers and handlers had not let them out one at a time. The dogs were not large in stature, but they were very strong, and they were all clearly anxious to go. Eventually, the harnessing and preparations were done but the poor dogs still had to endure the torture of waiting, as there was still some time before the official start of the race. Finally, the mushers took their positions on the sleds, the announcer counted down and off they all went! It was amazing how quickly they were out of sight. Equally amazing, but much less entertaining, was how quickly my fingers and toes had begun to freeze. After popping back to the main jamboree site for a bit, it was time to go home and warm up. March provides indisputable evidence that spring is on its way, but it also reminds us that the gods of winter are still in charge. Copyright © Kathryn Birchwood and FrozenTrini 2013. The use and/or duplication of this material without the express and written permission from this blog’s author and/or owner are unauthorised and strictly prohibited. Excerpts and links may be used, provided that full and clear credit is given to Kathryn Birchwood and FrozenTrini, with appropriate and specific direction to the original content.